I first encountered the Swamp Yankee by chance, when the poster for Wakefield’s Oktoberfest caught my eye. It was a complex art deco design in blues, greens and yellows, centered on a large crane surrounded by fleur-de-lis, corn stalks, Olympic flames and fish. It looked regal, grounded in nature but elevated, stylized but not cartoonish. Pete MacPhee is the Swamp Yankee, a graphic design artist in Portsmouth. On his website, intricate art deco pieces like the Oktoberfest poster keep company with ghoulish skulls, Edo-era samurai woodcuts and pop art pointillism. The designs he pumps out for musicians, block parties, motorcycle sales and beer cans veer in every stylistic direction, almost always deploying one central design (a bird, a forklift, a yellow jacket, Joe Strummer) whose detailed vividness gives it the impression of an icon, almost religious in aspect. Pete spent most of his childhood in Narragansett. In the early ‘90s, he collected a degree in fine arts and illustration out in Rochester and moved to Providence to start his career as a working artist the way so many do: freelancing. This meant some graphic design as well as working as a dispatcher for the ProJo, bringing newspapers to customers who hadn’t received them. On slow dispatching days he would sit in his car and draw. And fatefully, he began to silk-screen T-shirts and posters for local bands. Those local bands started opening up for bigger acts. He started doing design work for the Dropkick Murphys, a collaboration that continues to this day. Pete estimates that he’s designed “80 percent of their artwork, album covers, stage sets.” He’s also done years of work for Social Distortion and the Mighty Mighty Bosstones – including the stage set when the latter performed on Jimmy Kimmel Live!, with Kimmel on sax. 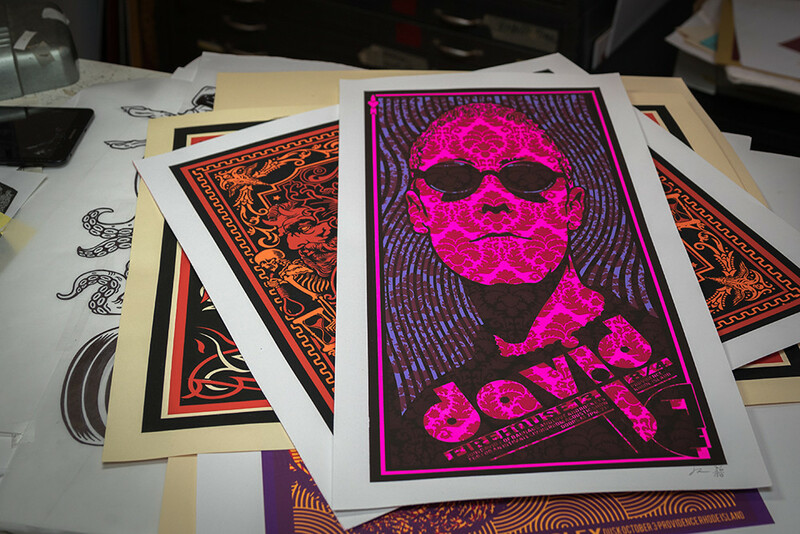 Even as his posters gain in popularity, Pete has a strict no-reissue policy: buy the posters when they’re made or don’t buy them at all. This, it turns out, is partly on the musicians’ behalf and partly a self-care practice: “There’s one Social Distortion poster I’d love to reissue, but I don’t do it. I don’t have time and it’s just kind of gentleman’s agreement with the band.” Then: “I print a lot but I hate printing, it drives me insane. I become a huge worrywart when I’m printing.” The posters must be printed one color at a time; the Wakefield poster used five. Sometimes he’s commissioned just to create an image in various formats (for Facebook, for posters, etc. ); then the customer will make their own copies at a print shop. Pete’s work has brought him into contact again and again with some of the most well-known names in music. He designed a T-shirt for Black Sabbath when the band had its first reunion—that summer, when he was living in Newport, “I did a lot of heavy metal: Mötley Crüe, System of a Down. Then the next summer I did Bob Seger, Lindsey Buckingham, ‘70s rock bands.” He did a poster for Blondie and, thanks to a connection with the merch woman (of course), took his then four-year-old daughter to watch the band warm up. He’s designed for the Cult, Linkin Park, Kid Rock (“when he played the Met. He kind of looked like Vanilla Ice”). He used his last $200 to design Iggy Pop posters, showed up at the show and asked about selling them. He wound up making $800 and spending the night talking to “this kid, kind of a big guy,” who he later found out was Iggy’s son. But that spontaneity and ease with which Pete managed to connect with some of the biggest bands in the ‘90s and aughts has become harder to rely on, he says. “Nowadays merch is a big thing. Bands don’t make money off of record sales, just merch.” Anxious to protect one of their only sources of income, they’re much less likely to let a stranger sell his homemade posters at a show. But Pete keeps busy at his studio, juggling commissions from musician customers, his freelance clients, and a little corporate work. A fan of Social Distortion happened to work at Toyota (“he’s like the top Toyota forklift salesman on the West Coast”) and now Pete’s doing calendars and technical drawings for them. He’s designed a Lovecraft-themed beer can – complete with a ship, waves, a lighthouse and a central, all-seeing eye – for Narragansett Brewing Company. 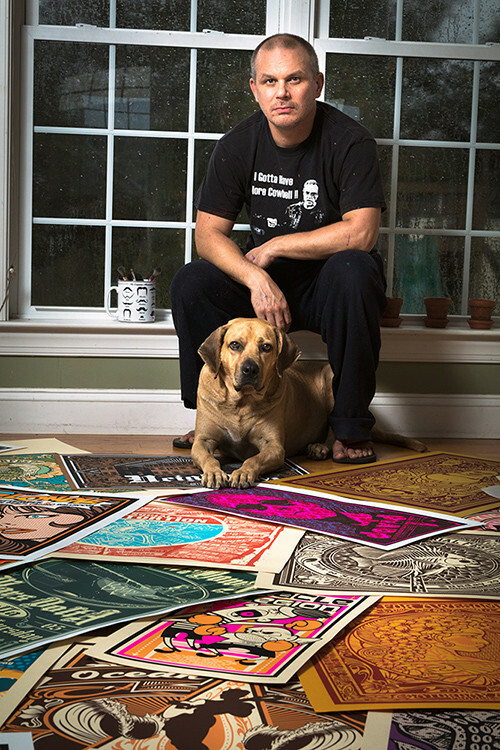 He sells his posters at street fairs four or five times a year – “it gets me out of the house, gets me freelance work” – which has led to gigs with various and sundry clients, including a plumbing company and a dog food brand. “I have no scruples,” he says.